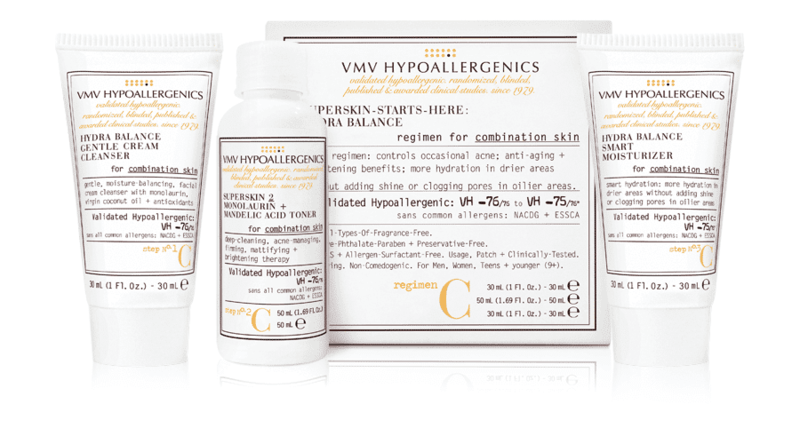 We are excited to introduce our newest skincare line VMV Hypoallergenics! VMV was the first – and is still the only – brand to rate its hypoallergenicity. Our VH-Rating System is published in Dermatitis, one of the leading peer-reviewed dermatological journals and shows less than 0.1% reported reactions to VMV HYPOALLERGENICS® products over 30 years. It is recognized as an effective way to objectively validate hypoallergenic claims in cosmetics. The “VH-Number” rating system “grades” a product’s safety based on how many allergens it does not contain, as referenced by the list of allergens compiled by objective, independent institutions the North American Contact Dermatitis Group + European Surveillance System on Contact Allergies. There are now 76 top allergens that are ingredients frequently found in cosmetics, or common cross-reactants/contaminants of cosmetics. VMV’s products are free of most or all 76 allergens, as reflected by the VH rating on the label. Uniquely, VMV continuously reviews studies and reformulates products if even just one ingredient becomes identified as an allergen. VMV HYPOALLERGENICS® stands behind a firm commitment to providing the most effective, and safest, products available. We are meticulous: Validated Hypoallergenic – VH-76/76 (sans all 76 common allergens), 100% All-Types-Of-Fragrance-Free, 100% Free of Dyes, Allergenic Surfactants, Phthalates, Parabens + Preservatives. Usage + Patch-Tested and Non-Comedogenic. Every little thing that goes into or near a product, and the product itself is patch tested for skin safety. And that’s just the beginning! What follows is a dizzying barrage of clinical tests, both in laboratories (in vitro) + on volunteers (in vivo), never on animals.